Our agency, RE/MAX United Vision is family-owned and has been in business for 19 years. After being a Registered Nurse for 22 years, Tracey wanted to run her own business and Tracey has been working here for over 9 years as a Fully Licensed Real Estate Agent. Tracey grew up in the local area, Tracey lives local, sells local and is intent on keeping local sale prices strong. We work hard for our sellers and treat every home as if it is our home. We tailor each marketing and selling approach to suit the individual seller and property. 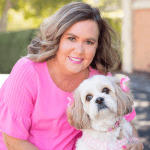 We also love to do pet-friendly properties, as we have Tiffany the Pink Property Pooch who features in our marketing which has been a big hit with my sellers and also the buyers love her too. Tracey Ashley and The Pink Team were in the Top 3 for the annual Marketing Award for RE/MAX Australia for 2015 & 2017. Tracey and Tiffany have also featured on national television on the Today show with Sonia Kruger and David Campbell. "Tracey was always professional & personable when selling my property, she kept me up to date during the whole sale process & I would have no hesitation in recommending her to sell or purchase through." " During my life I have bought and sold a number of properties through various avenues and agents. Tracey by far exhibited the most professional of attitudes and while her income is dictated by commission, I never felt that this was a concern for her. She always asked for instructions."